CHANGSHA, China, Nov. 16, 2018 /PRNewswire/ — On October 23, SANY Heavy Industry CO., LTD. (hereinafter referred to as SANY Heavy Industry) released its performance report of the third quarter. The company’s net profits attributable to shareholders are expected to be 4.68 billion yuan to 5.04 billion yuan in the first three quarters of 2018, an increase of 2.88 billion yuan to 3.24 billion yuan from the same period last year, year-on-year growth of 160 percent to 180 percent. In the first three quarters, the deducted non-net profit was 4.945 billion yuan to 5.409 billion yuan, year-on-year growth of 220 percent to 250 percent. Benefitting from infrastructure construction projects, equipment renewal and environment protection, the sales of the company’s excavating machinery, concrete machinery and hoisting machinery have achieved robust growth by further expanding their market shares. From January to September, SANY Heavy Industry has sold 35,000 excavators in the domestic market, ranking No.1 in the industry. In the first half year, the company’s net operating cash flow reached 6.21 billion, the highest record in the same period. According to an analyst of Zhongtai Securities, the company’s healthy financial situation offers more space for its further development. As a leading enterprise in China’s construction machinery industry, SANY will see sustainable growth in excavator sales and dynamic revival in concrete machinery sales. In recent years, SANY Heavy Industry took many efforts to push forward its international market strategy. In the first half year, the company achieved overseas sales revenue of 6.092 billion yuan. Additionally, it recruits local staff in overseas countries to better understand and service for local market. On September 13, SANY America manufactured the 2,000th excavator. On September 25, SANY India rolled out the first 37-meter Truck-mounted Concrete Pump manufactured in India, which symbolizes a new milestone of the localized production of SANY’s overseas branch companies. Presidents of Ghana and Guinea-Bissau visited SANY during the Investing in Africa Forum held in Changsha in September. Since its entry into the African market, SANY has exported more than 10 billion yuan worth of equipment to Africa. Since the beginning of this year, SANY Heavy Industry has been taking many efforts in business innovation and transformation, getting remarkable achievements in digitalization and intelligentialization for marketing, service, R&D, supply chain and financial affairs. Through the application of Internet of Things, SANY’s No.18 factory grew significantly in per capita efficiency and output. The company continuously increases investment in scientific research. 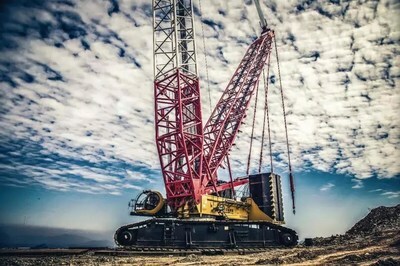 In the first half year of 2018, it invested 1.426 billion yuan and rolled out the SY155H mining excavator and SAC2200T all-terrain crane. What’s more, SANY Heavy Industry is expanding its business to firefighting, environment protection and other new fields. SANY’s brand has been widely received by the public and industry. SANY ranks 91st of the top 500 Chinese private enterprises in 2018, the highest ranked enterprise in professional equipment manufacturing industry. SANY ranks 9th on the list of “the most admired Chinese companies in 2018” released by the Fortune (Chinese Edition), taking the lead among construction machinery enterprises.